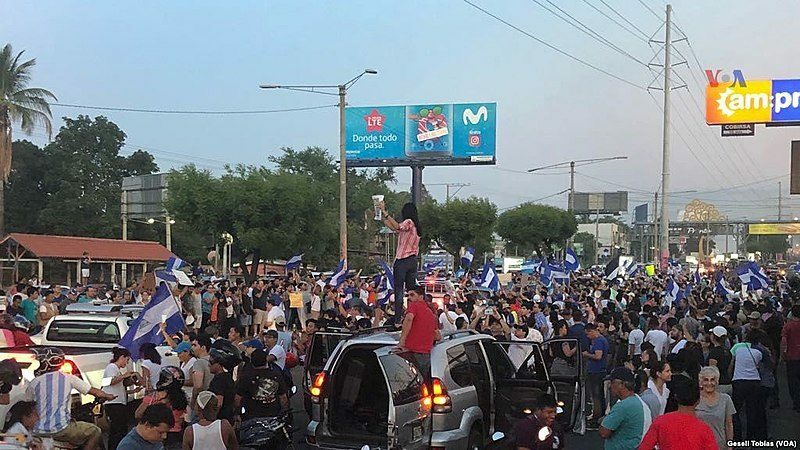 Protesters in the streets of Managua, Nicaragua's capital, in April 2018. Photo by Voice of America, released to public domain via Wikimedia Commons. According to the Nicaraguan Center for Human Rights, at least 34 people , including one journalist, have been killed during demonstrations  in Nicaragua over the past several days. What began as a protest against social security reforms has expanded into a broad-based public outcry  against the administration of President Daniel Ortega , who has been in office for 11 years but has held political power in the country in various roles since the 1979 Sandinista Revolution. Some are now calling for his resignation . Multiple TV networks have been taken off air or banned from broadcasting the demonstrations and one radio station was set on fire . Independent local news sites La Prensa  and Confidencial  suffered what appeared to be distributed denial of service (DDoS) attacks . Both had been reporting the most up-to-date accounts from the ground. TO OUR READERS For the past three hours, the Confidencial website has been out of service. We have determined that the cause is a targeted attack by the enemies of press freedom. Our technical staff are working to reestablish the site connection. We will continue posting updates on our social media channels. The Inter-American Press Association  the website condemned the attacks. In the city of Bluefields, on Nicaragua’s southern Caribbean coast, video journalist Angel Gahona was shot and killed  while filming and broadcasting a confrontation between protesters and police on Facebook Live. Gahona lived with his family and ran a small media outlet called El Meridiano. Multiple witnesses said the police were the only people in the area with weapons powerful enough to shoot and kill a person. Police have yet to release a statement regarding Gahona’s death. The Organization of American States  and the Inter-American Commission on Human Rights have condemned the media bans and the killing of Angel Gahona. His family members are soliciting support for funeral costs and their future on GoFundMe . Roberto Mesa, a digital activist in the Spanish island of Tenerife was arrested by police  at his home on April 18 after he posted a message on Facebook suggesting that the Bourbons (the royal family) should go “to the sharks”. In Spanish, the message rhymes: “Los Borbones, a los tiburones.” Supporters anticipate that he will be charged under Spain’s public security law , commonly referred to as the gag law  (“Ley Mordaza”), which places multiple prohibitions on public and online protest. Tanzanian news sharing and discussion platform Jamii Forums  was briefly kicked offline  this week due to a DDoS attack. Known for intense political discussions and revelations of corruption that take place on its comment and discussion threads, in a style similar to that of Reddit, Jamii is one of the most popular local sites in East Africa. The site’s co-founder and owner Maxence Melo is currently fighting charges  under Tanzania’s Cybercrimes Law for refusing police requests for forum members’ personal data. The social media campaign #IamLGBT pressured China’s information control apparatus to scale back its censorship  of LGBT content on social media. But after Weibo announced a three-month crackdown on games, multimedia and LGBT content, the hashtag #IamLGBT was used 500,000 times and had roughly 500 million views. Within days, the Chinese Communist Party publication the People’s Daily published a memorandum announcing LGBT content should not be confused with vulgar, violent or pornographic content, and Weibo announced its three-month crackdown would no longer target LGBT content. Is a Russian troll farm really launching a news agency? The information flow coming from the US and its allies, which is aimed at discrediting the Russian Federation, should not remain unanswered by the Russian media…The Federal News Agency (FAN) is not going to put up with the hegemony of the US authorities in the information field. YouTube removed more than 8.2 million videos between October and December 2017, 6.68 million of which had been flagged automatically by systems that are built to identify sexual abuse and violent extremism imagery. The company published this information in its most recent transparency report , marking the first time that a major Silicon Valley company has included this level of detail about content removed  from its platform. Who will be next in line? Facebook took steps toward making its content moderation processes more transparent by publishing most of the internal guidelines  its moderators use to enforce its community standards. The company excluded information about issues like terrorism to prevent users from taking advantage of the publication of the guidelines. The company also announced plans  to allow users to appeal the removal of a photo, video or post in addition to the removal of an account or page for certain categories of content. In the future, Facebook says it will give people the opportunity to provide additional context and to allow users to appeal content that is reported and left up. Afef Abrougui , Renata Avila , Ellery Roberts Biddle , Rohith Jyothish , Oiwan Lam , Karolle Rabarison  and Sarah Myers West  contributed to this report.